Following antiretroviral therapy, HIV-infected patients show increased circulating levels of the antidiabetic hormone fibroblast growth factor 21 (FGF21). In contrast, the expression of the FGF21-obligatory coreceptor β-Klotho (KLB) is reduced in target tissues. This situation is comparable to the FGF21 resistance status observed in obesity and type 2 diabetes. Here, we performed the first systematic study of the effects of distinct members of different antiretroviral drug classes on the FGF21/KLB system in human hepatic, adipose, and skeletal muscle cells. Most protease inhibitors and the nonnucleoside reverse transcriptase inhibitor efavirenz induced FGF21 gene expression. Neither nucleoside reverse transcriptase inhibitors nor the viral entry inhibitor maraviroc had any effect. Among the integrase inhibitors, elvitegravir significantly induced FGF21 expression, whereas raltegravir had minor effects only in adipose cells. In human hepatocytes and adipocytes, known target cells of FGF21 action, efavirenz, elvitegravir, and the lopinavir-ritonavir combination exerted inhibitory effects on KLB gene expression. Drug treatments that elicited FGF21 induction/KLB repression were those found to induce endoplasmic reticulum (ER) stress and oxidative stress. Notably, the pharmacological agents thapsigargin and tunicamycin, which induce these stress pathways, mimicked the effects of drug treatments. Moreover, pharmacological inhibitors of either ER or oxidative stress significantly impaired lopinavir-ritonavir-induced regulation of FGF21, but not KLB. In conclusion, the present in vitro screen study identifies the antiretroviral drugs that affect FGF21/KLB expression in human cells. The present results could have important implications for the management of comorbidities resulting from side effects of specific antiretroviral drugs for the treatment of HIV-infected patients. Our laboratory is specialized in the study of the molecular and cell biology of the control of mitochondrial energy metabolism and associated diseases. We study the molecular mechanisms of transcriptional control of the differentiation of specialized cell types with key roles in energy homeostasis (adipocytes, muscle cells,...) as well as how metabolic and endocrine functions are regulated in cells and tissues. For this purpose, we use experimental models at a sub-cellular (mitochondria), cellular (cell culture) and animal (gene-modified rodent models) levels of analysis. This is complemented by studying directly samples from patients with metabolic diseases (obesity, lipodystrophy, diabetes,...). Our aim is to identify the main molecular actors that control energy metabolism in health and disease, and by this means to establish foreseeable prevention and treatment strategies to ameliorate complex metabolic diseases. The ADIPOPLAST research network, leaded by our research group, meets at Santiago de Compostela. 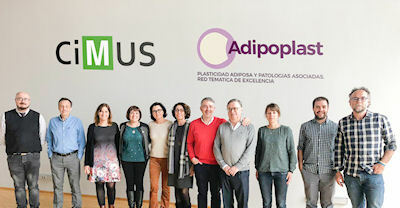 The Adipoplast network organized an open symposium on "The adipose tissue plasticity in health and disease" followed by an internal organizational meeting at "Centro Singular de Investigación en Medicina Molecular y Enfermedades Crónicas (CIMUS)", Santiago de Compostela, the last March 12th. Members of the Adipoplast network presented recent research advances as well as collaborative perspectives. External speakers were the international reputed scientists on adipobiology Dr L. Fajas (University of Lausanne, Switzerland) and Dr. R. Nogueiras (CIMUS). More than forty attendants participated. Plans for further actions were developed in the Adipoplast organizational meeting. 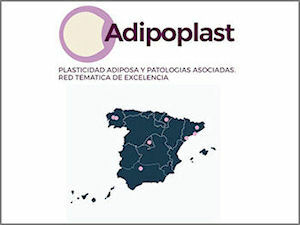 Adipoplast is a "Red de Excelencia" supported by the Spanish government to promote interdisciplinary research on adipose tissue, and is coordinated by Francesc Villarroya. 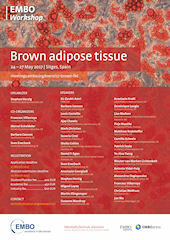 Brown fat, obesity’s ally: our research group at the 17th edition of Live Research Fair in CosmoCaixa Barcelona. 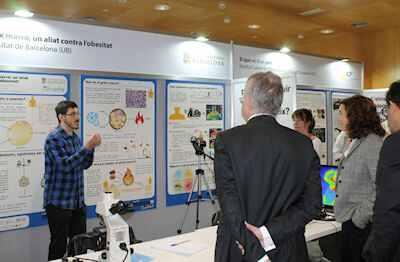 The Live Research Fair is a forum organized by the Barcelona Science Park (PCB) and Obra Social la Caixa which gather research groups from Catalan institutions to create a communication space for science and society –beyond the and research atmosphere- and promote scientific vocations among youngsters. The Live Research Fair is part of the science dissemination program of PCB’s Recerca en Societat. This year, from March 6 to 9, attendants will see the relationship between the active brown fat and a good metabolic health through the assessment of brown fat activity through infrared thermography. Dr Ruben Cereijo is coordinating this activity at our stand in the Fair. The December 2018 issue of the Spanish Society on Biochemistry (SEBBM) magazine highlights our discovery of CXCL14 as a brown adipokine published in Cell Metabolism. 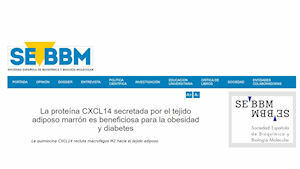 See pdf: "La proteína CXCL14 secretada por el tejido adiposo marrón es beneficiosa para la obesidad y la diabetes"
Joan Villarroya awarded with the "Eduardo Gallego" fellowship by "Fundación Francisco Cobos"
Dr. Joan Villarroya, assistant professor at UB and associated with our research team, has been the first of the two awardees by Fundación Francisco Cobos with an "Eduardo Gallego" fellowship. Fundación Francisco Cobos is an organization with the objective of supporting and promoting research in the area of Biomedicine. 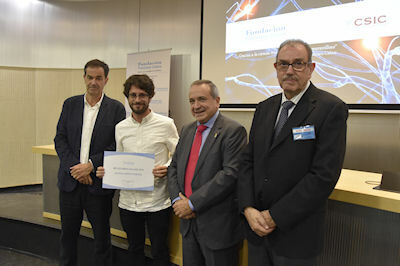 The "Eduardo Gallego" awards support the continuity in the scientific career of outstanding postdoctoral researchers in the field of Biomedicine. 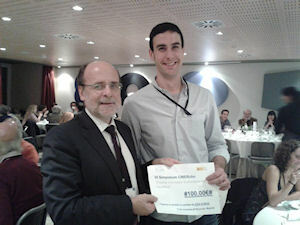 Joan Villarroya, awarded with the " Eduardo Gallego" fellowship by "Fundación Francisco Cobos"
Lipodystrophies are a complex group of diseases involving pathogenic alterations in adipose tissue quantity and distribution. Distinct types of lipodystrophies include rare genetically driven pathologies as well as acquired forms of the diseases caused biological or pharmacological insults as, for example, in HIV patients under treatment. 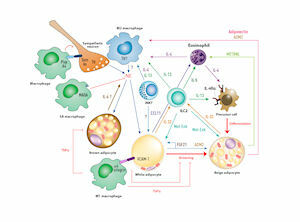 The chapter summarizes current knowledge on these diseases and therapeutic possibilities. The chapter was made possible thanks to the collaboration with Dr. David Araújo-Vilar, an internationally recognized expert in lipodystrophies and promoter of the Spanish Society of Lipodystrophies. Research with transgenic mice expressing HIV proteins is contributing to our understanding of the metabolic alterations in patients due to HIV infection-related events, regardless of antiretroviral treatment side effects. 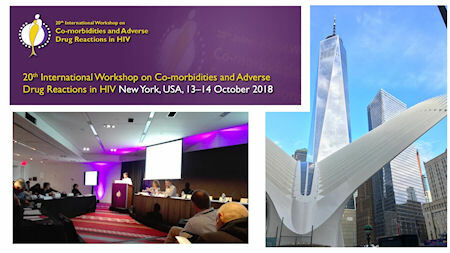 Dr. J. Villarroya was invited to present our data on adipose and bone alterations in these mice at the New York Academy of Sciences, in the context of the 20th International Workshop on Co-morbidities and Adverse Drug Reactions in HIV the last 13th October. 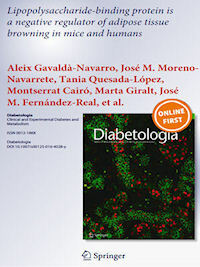 This new study, published in the journal Cell Metabolism, with Dr Rubén Cereijo and Dr. Aleix Gavaldà-Navarro as first authors, notes that this protein is synthetized by the brown adipose tissue and can activate anti-inflammatory activity cells –M2 type macrophages- that produce a beneficial effect in the organism, particularly in metabolic diseases such as obesity and diabetes, allowing new possibilities to develop new therapeutic tools. Dr D. Sánchez-Infantes, from Institut de Recerca Germans Trias i Pujol, contributed to the study with human analyses, thus providing evidence of the importance of CXCL14 in obese patients. 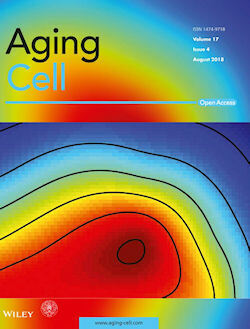 The on-line version of the paper Aging is associated with increased FGF21 levels but unaltered FGF21 responsiveness in adipose tissue in Ageing Cell is already available. FGF21 is a hormonal factors proposed to play an anti-aging role. The paper reports unaltered sensitivity to FGF21 in adipose tissue in aging, despite increased FGF21 levels in elderly individuals. The study was possible thanks to a unique cohort of healthy elderly volunteers who agreed to participate and provide blood and tissue biopsies for the study. Several research projects have been developed in the last years in our lab in collaboration with Lucta SA. Lucta is a company committed to develop feed additives in order to offer sustainable solutions in palatability, efficiency, animal welfare and health. In collaboration with Lucta we have been exploring the main factors determining intestinal maturation in pigs, their consequences for porcine livestock improvement and tools to improve intestinal function. Some of the data obtained are now shown in the paper "Developmental regulation of the intestinal FGF19 system in domestic pigs" published in the American Journal of Physiology. Gastrointestinal and liver physiology", a leading journal in gastroenterology-related research. The study, leaded by Dr Aleix Gavaldà-Navarro, from our lab, and Dr. I. Ipharraguerre, from Lucta, highlights the developmental regulation of the enterokine FGF19 in pigs. Dr Ofelia Mora, from the Laboratorio de Rumiología y Metabolismo Nutricional, Facultad de Estudios Superiores Cuautitlán, Universidad Nacional Autónoma de México, visited our laboratory in the second week of July in the frame of current collaboration with our lab. Collaborative research involves in vitro studies in adipose tissue, liver and muscle from cows and other species of interest in the liverstock industry. Dr. Marion Peyrou was awarded with "best poster" presentation in the track of Obesity in the European Congress of Clinical Investigation 2018. Dr. Montserrat Cairó and the PhD student Gemma Ferrer were also awarded with "best poster" presentations in the tracks of Mitochondria and Cardiology. 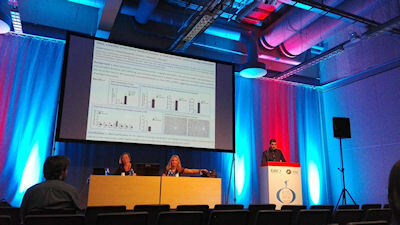 Francesc Villarroya presented the main results on the role of Alex3 in the hepatic carcinogenesis induced by lipotoxicity, a project coordinated with E. Soriano from the Department of Cell Biology of UB, and B. Minguez from the Institut de Recerca Vall d'Hebron, awarded in the Fundació Marató de TV3 call 2012. The importance of Alex3 in hepatic carcinogenesis in relation to hepatic steatosis and a high fat diet has been identified obtained thanks to interdisciplinary project supported by Marató de TV3. Our research group gathered for a two-day retreat at Sitges. Current research projects and organizational programming of the laboratory were discussed and activities for the forthcoming 2018 year were planned. 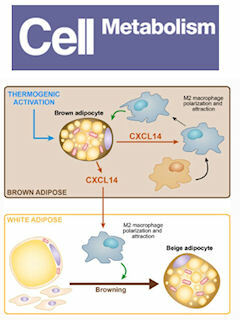 Cell Metabolism publishes our study "Toward the understanding of the role of immune cells in brown and beige adipobiology"
Our publication discusses the cross-talk between immune cells and brown/beige adipocytes, which is being recently recognized as a key process for thermogenic regulation. 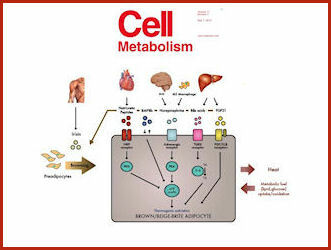 Cell Metabolism is the leading international journal on metabolism research. 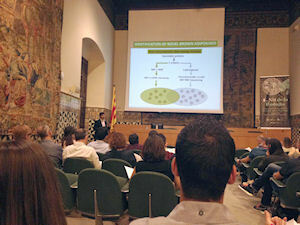 Our research team has participated in the XIV meeting of the Spanish Society for Study of Obesity (SEEDO) in Lleida. 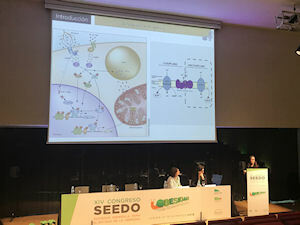 Dr. R. Cereijo and T. Quesada presented our current research on omics applied to obesity research and lipid signaling, whereas L. Campderrós presented her research on GDF15 as a novel brown adipokine. What does it mean to take part in a research project that is funded by La Marató? 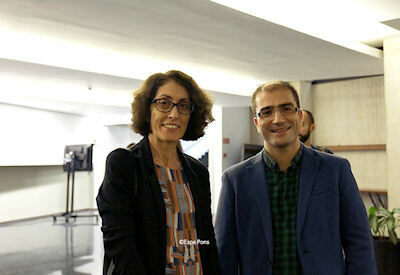 The masterclass, the first one launched by the University of Barcelona and La Marató de TV3 Foundation, shared among the university community, the elements that make this project an example to follow in the field of solidarity and support to biomedical research. 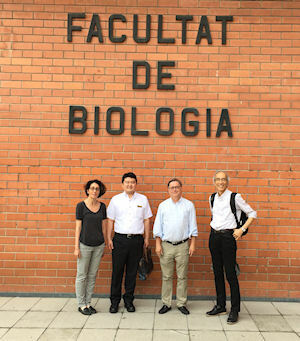 The masterclass in the Faculty of Biology was presided over by the Rector, Joan Elias and covered the initiatives of La Marató Foundation as the drivers of the scientific research in Catalonia. 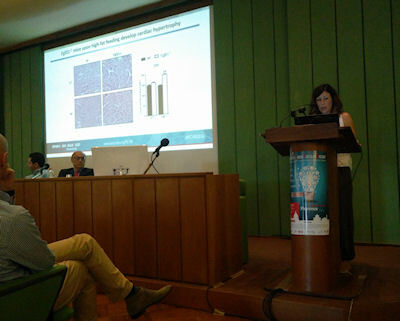 Marta Giralt presented the project developed by our research team and funded by La Marató 2015: Identification of molecular mediators of signalling from intestine to insulin sinsitization and the browning of adipose tissue: role of LBP and FGF15/19. 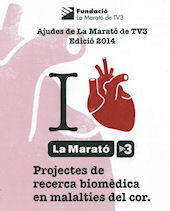 La Marató de TV3 is an initiative that mobilizes people to support research on different diseases. Since 1992, thanks to people’s donations, it has collected more than 170 million euros, that have funded a total of 794 research projects with more than 7,300 involved researchers in Catalonia. The December issue of Trends in Endocrinology and Metabolism publishes our study "Lives and Times of Brown Adipokines"
Our publication summarizes the state-of-the-art of the secretory function of brown adipose tissue. Trends in Endocrinology and Metabolism is a leading journal on the current research and trends in metabolism edited by the Cell group. 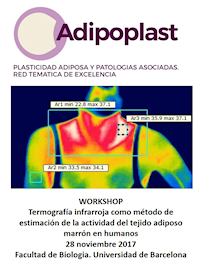 Francesc Villarroya, as coordinator of the ADIPOPLAST network, organizes a workshop on the use of infrared thermography to estimate brown adipose tissue activity in humans. Invited experts from the University of Granada, University of Cadiz, and Institut de Recerca Germans Trias i Pujol, Badalona, will attend the meeting. Advantages and limitations of this technology and its application to distinct pathophysiological conditions in humans will be discussed. The meeting will be at Aulari, Sala de Juntes, Facultat de Biologia, University of Barcelona, next 28th November, from 12:00 to 15:00. 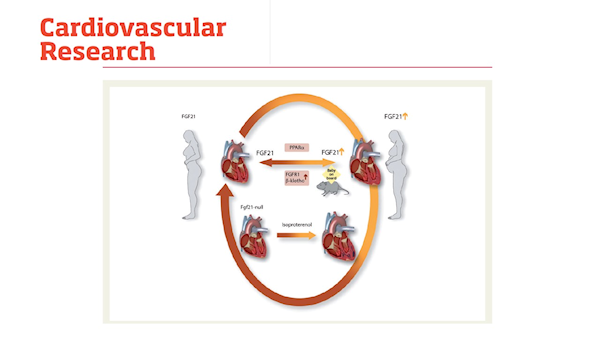 On occasion of the our publication on the involvement of FGF21 in the physiological cardiac hypertrophy during pregnancy in Cardiovascular Research, M.Sampaolesi and K.Van Calsteren, highlight the relevance of our findings in relation to cardiac remodeling in gestation. See the link to the publication, fully available as Editor’s Choice (https://academic.oup.com/cardiovascres/article/113/13/1574/3797836/Fgf21-is-required-for-cardiac-remodeling-i) and editorial (https://doi.org/10.1093/cvr/cvx192 ). Researchers in our team devoted to investigation on the role of autophagy on metabolic and tissue remodeling adaptations in adipose tissues and heart join the Network of Excellence for Autophagy Research. NEAR aims at strengthen the competitiveness of the Spanish groups interested in the field of autophagy and boost forwards the excellence of basic and translational research. NEAR integrate in a forum all the groups interested in the field of autophagy in Spain. Our research team collaborates in a study reporting new brain signaling pathways mediating the control of thyroid hormones on body weight and metabolism, as published in Cell Metabolism. A study lead by Miguel Lopez and participated by our team, is published in the July issue of the prestigious journal Cell Metabolism. 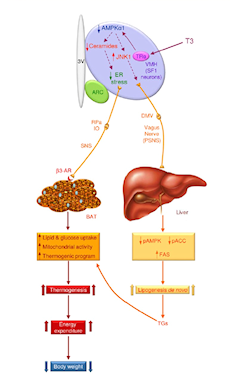 The study shows that thyroid hormones act in the hypothalamus to regulate hepatic lipogenesis and brown fat lipid oxidation via the parasympathetic and sympathetic nervous systems. These peripheral effects are orchestrated by two distinct signaling pathways in the ventromedial hypothalamus, JNK1 and ceramides/ER stress, which are under AMPkinase control. 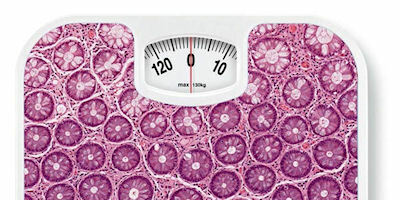 Brown adipose tissue –main organ generating heat in the body- is also an endocrine organ that secretes signaling factors that activate the fat and carbohydrates metabolism. 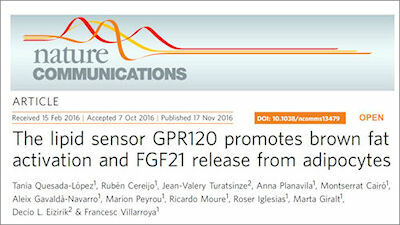 Evidence for this statement is provided in the article of the January 2017 issue of journal Nature Reviews Endocrinology, from our research team, signed by the professors Francesc Villarroya, Rubén Cereijo, Joan Villarroya and Marta Giralt, from the Department of Biochemistry and Molecular Biology and CIBER of Physiopathology in Obesity and Nutrition (CIBERobn) of the Institute of Health Carlos III. Meeting with Dr Iwamoto, from Jichi Medical University, Japan, to strengthen collaboration. Dr Iwamoto and colleague from the Division of Human Genetics at Jichi Medical University, Shimotsuke, Japan, visited our laboratory to strengthen our long-standing collaboration. Future prospects on RBP4, a matter of previous collaboration, and other molecules potentially involved in non-alcoholic fatty liver diseases were the subject of a discussion session with our research team. The Spanish Society on Biochemistry (SEBBM) highlights our discovery of the role of poly-unsaturated fatty acids in the control of brown fat thermogenesis. The March 2017 issue of the SEBBM magazine quotes our publication in Nature Communication as a highlight. The study by Tania Quesada and co-workers in our lab was also chosen as the best monthly article by SEBBM in February 2017. 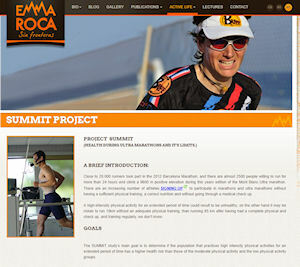 Our research team participates in the Summit project on the cardiac and metabolic status of marathon runners assessing brown adipose tissue activity. Francesc Villarroya co-organizes the EMBO Workshop "Brown Adipose Tissue"
The workshop will be held in Sitges, next 24-27 May 2017. Deadline for abstract submission is March 1st, deadline for application to register is March 17. A panel of internationally renowned researchers in the field will participate as speakers (see announcement poster). 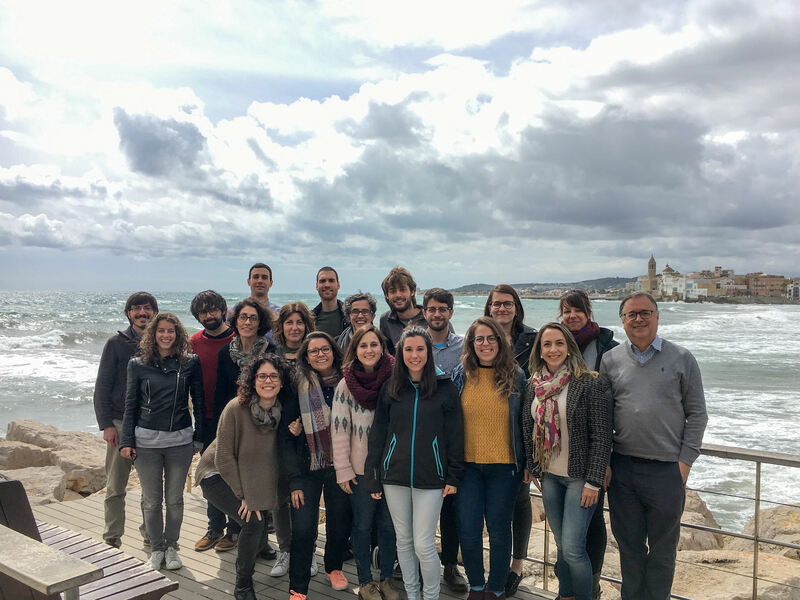 On occasion of the beginning of the year, our research group gathered for a whole-day retreat at Fundació Pedro i Pons, a facility of University of Barcelona located at a XVIII century country house close to Vallvidrera. Current research projects were discussed and activities for the forthcoming 2017 year were planned. The December 2016 issue of the journal of the Spanish Society of Biochemistry and Molecular Biology (SEBBM) devotes its scientific dossier to "The biochemistry of obesity." 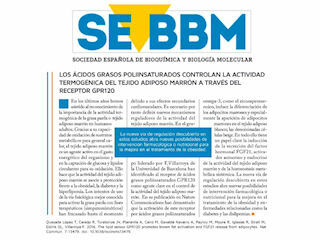 Francesc Villarroya has been in charge of coordinating this issue with contributions by researchers from several laboratories and introducing the dossier with the article "Is obesity, a biochemical problem?” Moreover, our research team contributed to the dossier with the article "Brown fat, an emerging actor in the control of energy expenditure" .The SEBBM is one of the most prestigious scientific societies in Spain, it is the non-medical scientific society with more affiliates of Spain (4000). 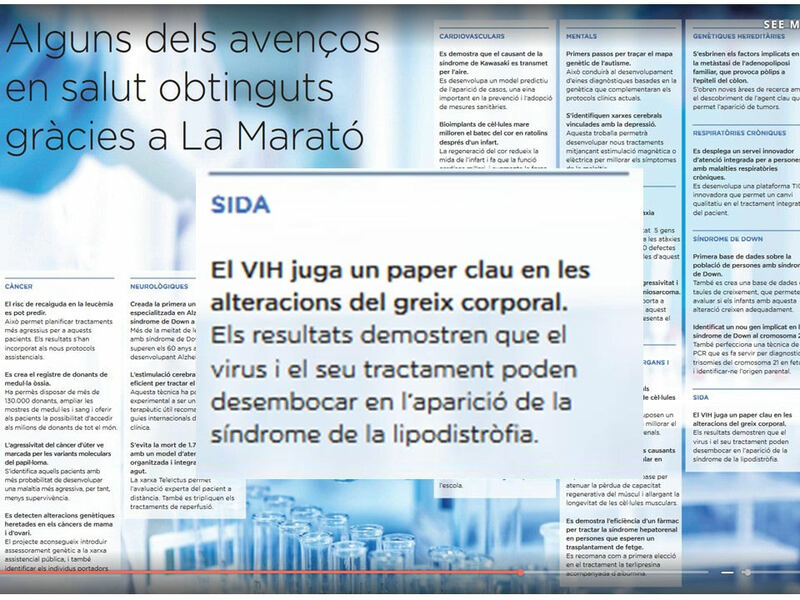 The special issue of "Mon Marató" on occasion of the 25 anniversary of Marató de TV3 quotes as a highlight of these 25 years the achievements of our lab in relation to lipodystrophy as a metabolic alteration in HIV patients as a highlight of these 25 years. 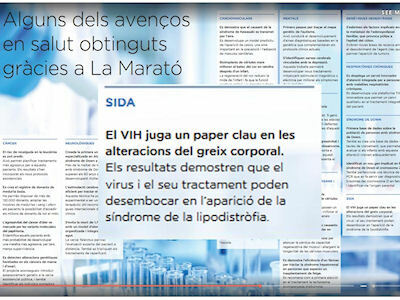 In 2001 our research group was awarded by Fundació Marató de TV3 to develop, in coordination with the research group leaded by Pere Domingo, in Hospital de la Santa Creu i Sant Pau, the project "Molecular basis of lipodystrophy associated with highly active antiretroviral therapy in AIDS patients: a genomic approach", which was developed from 2003 to 2005. That study allowed the identification of the main factors associated with HIV infection and anti-retroviral treatment which cause the appearance of the lipodystrophy syndrome in the patients. 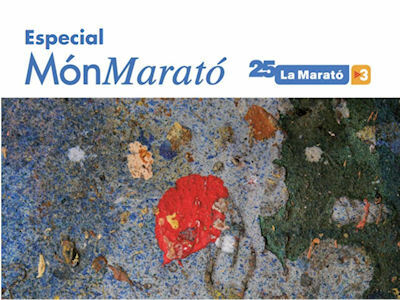 The "Mon Marató" journal, on occasion of the 25 anniversary of Marató de TV3, quotes as a highlight in AIDS research our findings. The discovery of the role of GPR120 in brown and beige function, published in Nature Communications. This study, carried out in our laboratory using cellular and animal models shows that omega-3 fatty acids (n-3 PUFAS) stimulate the activation of brown and beige adipose tissue through a specific receptor (GPR120), which enables the release of the hormone FGF21 ( fibroblast growth factor-21). This hormone is a molecule that regulates lipid glucose and metabolism and therefore, it is an effective target for the beneficial metabolic actions of omega-3. 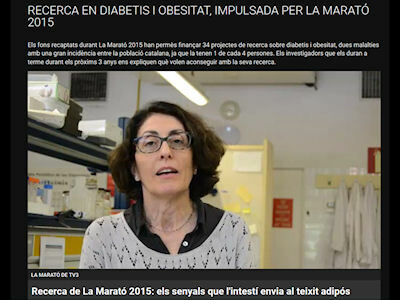 The project "Identification of molecular mediators of signaling from intestine to insulin sensitization and adipose tissue browning: role of LBP and FGF15/19", headed by Marta Giralt, is awarded by Fundació Marató de TV3. 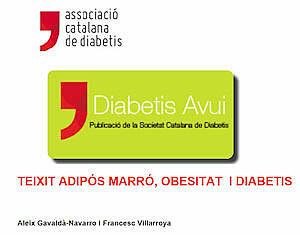 The project "Identification of molecular mediators of signaling from intestine to insulin sensitization and adipose tissue browning: role of LBP and FGF15/19" has been awarded after the 2015 call from Fundació Marató de TV3 for funding research projects on diabetes and obesity. This is a coordinated project involving also the team headed by José M. Moreno-Navarrete from the "Josep Trueta" hospital in Girona. Anna Planavila heads the project "Meteorin-like, una nueva cardiomioquina para la detección y tratamiento de la enfermedad cardiaca" funded by the Spanish Society of Cardiology in the basic research field. 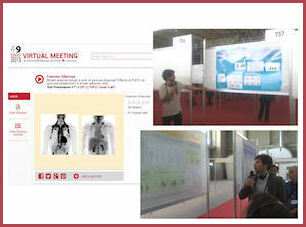 On the occasion of the Congress of the Spanish Society of Cardiology (SEC) held in Zaragoza between last 27 and 29 October, it was handed the award to Anna Planavila certifying the obtaining of funding to develop the project "Meteor-like, una nueva cardiomioquina para la detección y tratamiento de la enfermedad cardíaca" after the SEC 2016 call. This project is framed within the area of research in molecular cardiology coordinated by Anna Planavila within our group. The web page for Adipoplast is available. Adipoplast.org is the link for the webpage of Adipoplast, a Spanish research network funded by MINECO under coordination by Francesc Villarroya. Eight research groups belong to the network which is focused to the study of adipose tissues and associated pathologies. 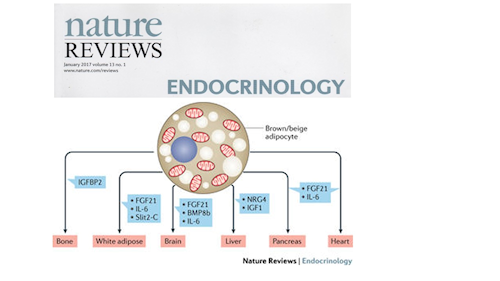 Nature Reviews Endocrinology publishes our research on the endocrine role of brown adipose tissue. 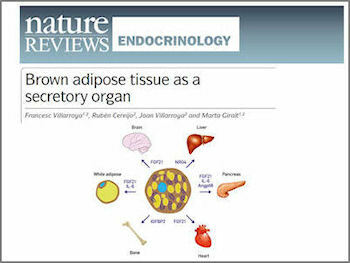 Nature Reviews Endocrinology, a leading international journal in the field of endocrinology, publishes the article "Brown adipose tissue as a secretory organ" authored by F. Villarroya, R. Cereijo, J. Villarroya and M. Giralt, which describes the recent research by our groups and others evidencing an endocrine role for brown adipose tissue. This new concept about the physiological role of brown fat is very relevant to research on the causes of obesity and type II diabetes and the search for new drugs for treatment. 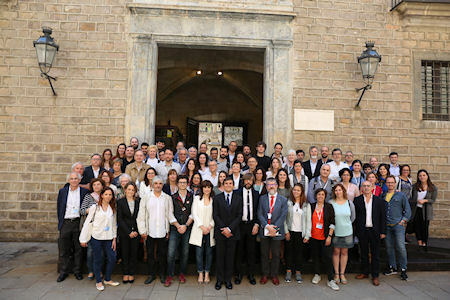 Our group contributes to the "Frontiers in CardioVascular Biology" biennial meeting of the European Society of Cardiology Council on Basic Cardiovascular Science in Florence, Italy. 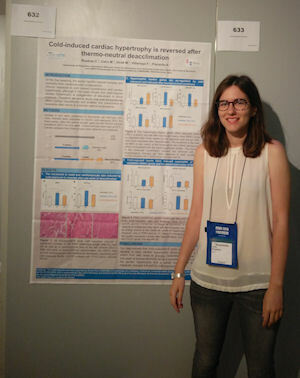 Anna Planavila was chosen to present the study "Involvement of the Fgf21 system in obesity-associated cardiomyopathy", whereas Celia Rupérez presented the poster communication " Cold-induced cardiac hypertrophy is reversed after thermo-neutral deacclimatization". "Frontiers in Cardiovascular Biology" is considered one of the most relevant exchange platforms for basic and translational cardiovascular biology. A study from our laboratory leaded by Aleix Galvadà-Navarro, in collaboration with the J Moreno-Navarrete and JM Fernández-Real at Hospital Josep Trueta in Girona identifies LBP as a negative regulator of browning of adipose tissue. Diabetologia, a top rated journal in the field of diabetes and metabolism, publishes this study. The identification of negative regulators of browning in an emerging field with utmost relevance in the identification of novel agents causing obesity and diabetes and potential targets of intervention. This study is the result of a collaborative task supported by "CIBER Fisiopatología de la Obesidad y Nutrición". The communication "Alex3, a member of the Armcx family of proteins: a novel actor in the control of energy homeostasis" by Dr Aleix Galvadà-Navarro, awarded as the best poster pitch communication in the European Obesity Summit 2016 held in Gothenburg, Sweden. The European Obesity Summit 2016 congress, a common initiative of the European Association for the Study of Obesity (EASO) and the International Federation for the Surgery of Obesity (IFSO), was held in Gothenburg between 1 and 4 June 2016. Dr Tania Quesada was elected for oral presentation of our studies on "Effects of omega-3 PUFA on brown and beige adipocyte differentiation and activation" .Dr Aleix Gavaldà-Navarro presented our studies on the relationship between the Armcx genes and lipotoxicity., a study supported by Fundació la Marató de TV3, in a poster pitch session. His contribution obtained the award to the best communication in basic sciences. Our research group participates in the first "Adipose tissue metabolism in obesity" international symposium, organized by the MetNet network in Barcelona. Prof. Marta Giralt contributed with the presentation "Adipose tissue biology: new insights from the study of adipose-related diseases", and Dr Ruben Cereijo with "A secretory role for brown adipose tissue: Identification of novel brown adipokines"
"Targeting brown and beige fat to counteract obesity and the metabolic syndrome", invited presentation from Francesc Villarroya at the 13th International Congress of Obesity in Vancouver. 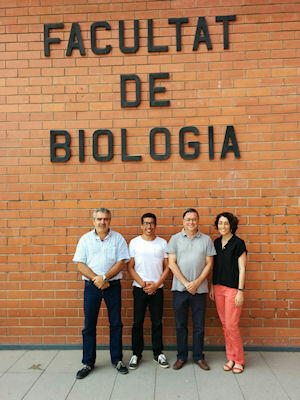 Francesc Villarroya was invited to present recent research on the discovery and characterization of novel molecules capable of regulating brown and beige adipose activity. 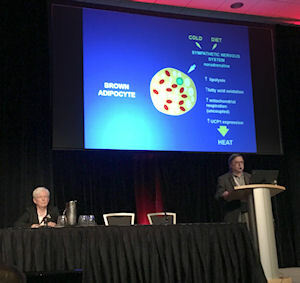 The 13th International Congress of Obesity held in Vancouver gathered close to one thousand international researchers in the field of obesity and related metabolic diseases. 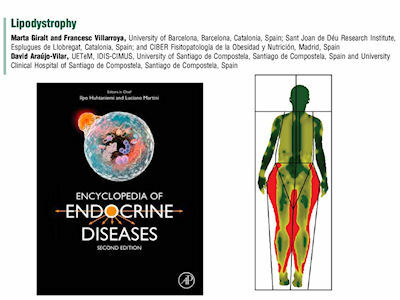 Francesc Villarroya, elected as one of Endocrinology's 2015 Best Reviewer. Francesc Villarroya has been elected as one of Endocrinology's 2015 Best Reviewers, based on an excellent record of quality reviews and loyal service. The award winners will be acknowledged at the 2016 editorial board meeting. Endocrinology is the major Endocrine Society’s journal since 1917 and has defined the science of endocrinology for most of the twentieth century, being one of the most authoritative biomedical research journals in the world. Two communications by Marion Peyrou and Ibon Redondo-Angulo, researchers in our lab, awarded for best poster contributions in the 12th Congress of the Spanish Society for the Study of Obesity held in Málaga 25-27th November. 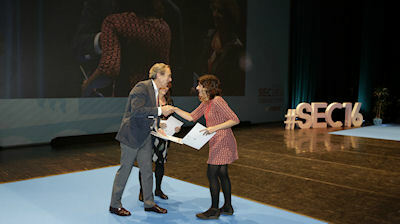 In the picture Marion Peyrou receiving the award from Dr MM Malagón, head of the awards committee. 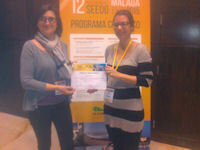 Anna Planavila awarded by Fundació Marató TV3 for developing a research project on cardiac diseases. The project" Role of the new cardiomyokines FGF21 and Metrl in cardiac damage caused by alcoholism and hypertension", leaded by the senior researcher Anna Planavila in our team, has been awarded after selection among the 121 applications to this call. The project will be developed in coordination with Joaquim Fernàndez-Solà, from IDIBAPS. Researchers received their awards the last November 5th at Acadèmia de Ciències Mèdiques i de la Salut de Catalunya i Balears. Our research team leads the Spanish Research Netwrok "Adipose plasticity and associated pathologie" from MINECO. MINECO has awarded the research network"Adipose plasticity and associated pathologies" in the 2015 call for two year activity. 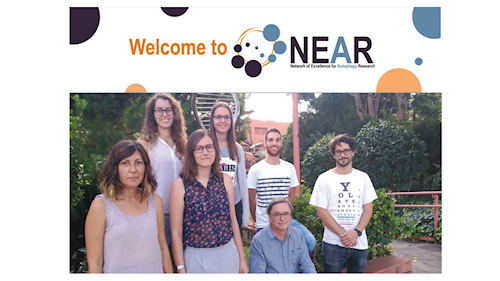 The network includes research teams from Universidad de Santiago de Compostela, Universidad de Córdoba, Universidad Rey Juan Carlos I de Madrid, Universidad de Navarra, Hospital Josep Trueta i Universitat Rovira i Virgili, and our team ta UB will act as coordinator. The network is focused to research on the processes of altered adipose tissue occurring in obesity and lipodystrophy, and the use of adipose tissue as a source for tissue transplantation and isolation of precursor cells for regenerative medicine. Interview to Francesc Villarroya at El Punt Avui TV in relation to the discovery of FGF21 in breast milk and its beneficial effects on neonates. Our group publishes the results on the presence of FGF21 in breast milk and its beneficial effects on intestinal maturation of newborn. The work demonstrates that the hormonal factor FGF2 has a key role in the absorption of nutrients and regulating intestine function in newborns, and helps improve neonatal growth and metabolic profile during the first weeks of life. The results of the work have been published in the journal Scientific Reports. This work has been largely a result of the project "FGF21 as a new factor present in milk, involved in the beneficial effects of breastfeeding" awarded three years ago to our research team in the research program RecerCaixa, Obra Social La Caixa, in collaboration with the Catalan Association of Public Universities (ACUP). FGF21 is a hormone with anti-obesity and anti-diabetic properties. 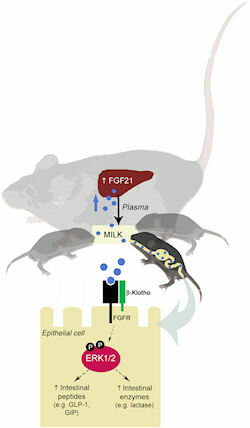 The research carried out has shown that FGF21 is present in human milk and rodents, and passing the baby through breast milk, acts on the gut, where it stimulates the production of enzymes that promote absorption lactose and other gastrointestinal hormones that help absorb nutrients properly. After these results, we are currentlyt investigating the long-term effects effects on metabolism of having been exposed to FGF21 from milk and if this factor is present and in what percentage in formula milk, with the support of a project recentlyawarded to our lab by Instituto Danone. The "Departamento de Inmunología Molecular del Centro de Investigación Biomédica de la Facultad de Medicina de la Universidad Autónoma de Coahuila, México", represented by Dr Francisco Carlos López Márquez, signed an agreement for research cooperation with our research team for studies on metabolic and immunologic alterations in HIV patients. 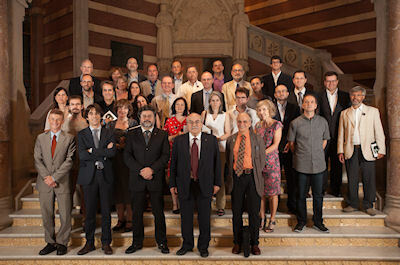 On Wednesday July 1, the auditorium Pau Gil at the modernist Hospital de Sant Pau area hosted the ceremony for the ICREA Academia 2014, a call which has distinguished scientific career of researchers from Catalan universities. The event, attended by the rector of UB, Dr. Dídac Ramírez, was chaired by the Minister of Economy and Knowledge, Dr. Andreu Mas-Colell, Secretary of Universities and Research, Dr. Antoni Castellà, and the director of ICREA, Dr. Jaume Bertranpetit. Interpol warns of threatening illegal slimming drug DNP. 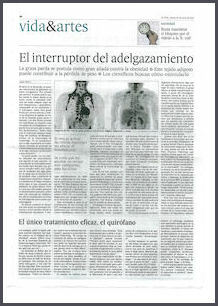 The dangers of uncontrolled mitochondrial uncoupling commented by Francesc Villarroya in "El País"
Francesc Villarroya comments in "El País" (5 May issue) the mechanisms of action of dinitrophenol as a mitochondrial uncoupler and the dangers of using it as slimming drug to promote energy expenditure. The recent death of an English obese patient due to DNP consumption highlights this concern. Catalonia has traditionally been a center of academic attraction for Mexican students. In 2014-2015 academic year there are about 400 students with scholarships from the National Council of Science and Technology of Mexico (CONACYT) to continue graduate studies, doctoral and postdoctoral fellowships in various Catalan institutions. In order to promote scientific cooperation between them, a meeting has been organized by CONACYT with the support of the Consulate of Mexico in Barcelona and Catalan Universities. 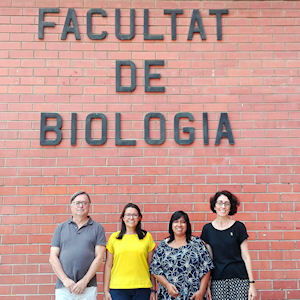 Tania Quesada, fellow in our research group, participated in the meeting and was selected for the "Tesis en 3 minutos" contest and for a report of her research in our lab appeared as press release in "CONACYT agencia de noticias". See http://www.conacytprensa.mx/index.php/ciencia/salud/1785-estudian-hormona-que-ayuda-adelgazar for further information. 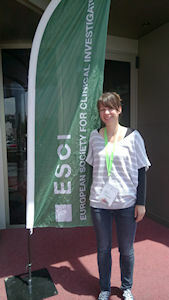 Our research team contributes to the Handbook of Experimental Pharmacology series with the chapter "Adipokines and the endocrine role of adipose tissues"
Tania Quesada, PhD student in our lab, awarded for the best poster presentation in the 22nd European Congress of Obesity (ECO 2015) in Prague. 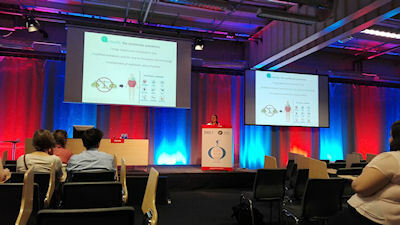 Our research team participated to the ECO 2015 meeting in Prague with an invited presentation by Francesc Villarroya on novel myokines, an oral presentation by Anna Planavila on heart damage caused by high fat diets and poster presentations by Tania Quesada on FGF21 action in adipose tissues and by José M. Gallego-Escuredo on ageing adipose tissue. Tania Quesada was awarded for the communication “Effects of FGF21 invalidation on brown and white adipose tissue pathophysiology“ presented in a poster pitch session. Our identification of the role of FGF21 in cardiac oxidative stress, in the cover of the April issue of Cardiovascular Research. 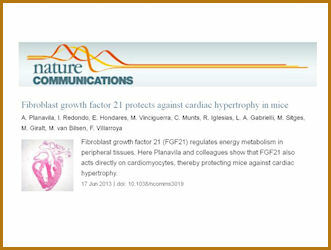 Under the title "Cardiac Fgf21 synthesis and release: an autocrine loop for boosting up antioxidant defenses in failing hearts", Cardiovascular Research, a highly reputed journal in the field of cardiac research, includes an extensive Editorial summarizing our findings on the role of FGF21 in cardiac protection on occasion of our publication "FGF21 protects the heart from oxidative stress" in the April issue of the journal. In the cover of the journal, a pictorial description of our findings on FGF21 action on heart is provided. The March 3rd issue of “El Periódico” summarizes the current views on brown adipose tissue activity in relation to obesity and comments by Francesc Villarroya. The ICREA Academia Awards are given for a period of five years in recognition of the scientific trajectory of university professors. Awardees receive funds over this period to support their lines of research,e ICRE teaching activities and allow awardees to concentrate on research. The BBVA Foundation funds the research project “Involvement of the Fgf21 System in Obesity-Related Heart Disease” coordinated by Francesc Villarroya and Anna Planavila. The main objective of the call was to increase individual and collective research opportunities in Spain in order to encourage scientific activity in biomedicine (oncology, cardiology, neurodegenerative diseases, etc. ), digital humanities, ecology and conservation biology and social and economic sciences. 589 projects competed for the six BBVA Foundation Grants for Research Projects in Biomedicine 2014. 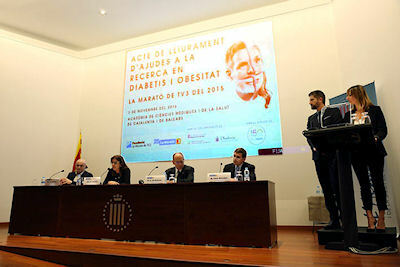 The project, based on the study of the heart damage as a consequence of obesity, will be developed in the next 3 years. Francesc Villarroya has received one of the two research grants awarded by the Danone Institute in the fields of food, nutrition and health. Our team will receive funds to develop the project “FGF21, a new bioactive factor of breast milk”. 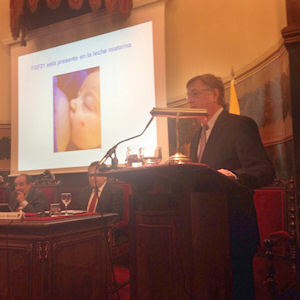 The award ceremony took place on Thursday 18 December at the Royal Academy of Medicine, in Madrid. The personalities who participate in the event were Teresa Robledo de Dios, adviser of the Spanish Strategy for Nutrition, Physical Activity and Prevention of Obesity of the Spanish Agency of Consumption, Food Security and Nutrition; Joaquín Poch, president of the Royal Academy of Medicine; Manuel Serrano, honorary president of the Danone Institute; Luis A. Moreno, president of the Danone Institute, and Joao Paulo Andorinha, R&D director of Danone. Aleix Gavaldà, awarded for best communication at the symposium "Obesity and Nutrition in the 21st Century"
The communication "Lipopolysaccharide binding protein-null mice are protected against obesity but show altered glucose homeostasis" by our research group, with Aleix Gavladà as first autor, got one of the five awards to best communications in the symposium organized by CIBERobn at El Escorial, Madrid. The study was based on the development and characterization of a mouse model to determine the role of LBP protein in adiposity and metabolism. This study was developed in collaboration with the research team leaded by JM Fernández Real, from Hospital Josep Trueta, Girona. 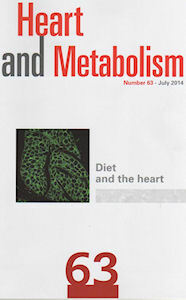 Our research on heart, in the cover of "Heart and Metabolism"
Anna Planavila and Francesc Villarroya, in collaboration with Manlio Vinciguerra, contribute to the July issue of of the journal Heart & Metabolism , devoted to "Diet and the heart", with the article . 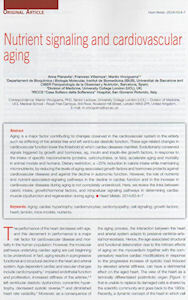 "Nutrient signaling and cardiovascular ageing". Heart and Metabolism is a quarterly journal focusing on the management of cardiovascular diseases. Its aim is to inform cardiologists and other specialists about the newest findings on the role of metabolism in cardiac disease and to create awareness of their potential clinical implications.The cover of the issue includes a picture of cardiomyocytes, corresponding to our research on cardiac hypertrophy. 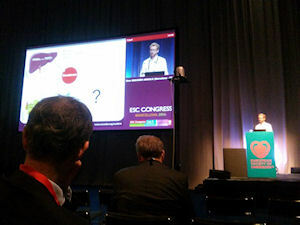 The European Socieity of Cardiology Congress, with over 30.300 delegates, held in Barcelona in September 2014, has been one of the biggest and most exciting in the history of the ESC society. The study “Involvement of fibroblast growth factor-21 in gestation-induced cardiac hypertrophy “, developed in our lab by Ibon Redondo under the direction of Anna Planavila and Francesc Villarroya, was selected for presentation in order to communicate the recent results of our research group on the regulatory role of FGF21 on cardiac function. 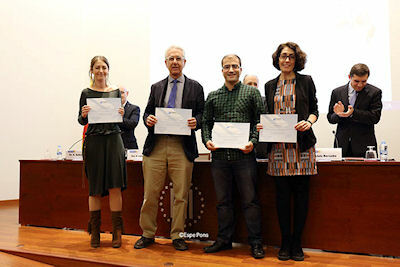 Ibon Redondo was also awarded with an ESC fellowships to the best communications. The study highlights the importance of cardiac function in pregnancy and the role of regulatory factors for healthy adaptations of heart to gestation. Ricardo Moure, pre-doc researcher in our lab, winner of FameLab Spain with a monologue about obesity and diabetes. 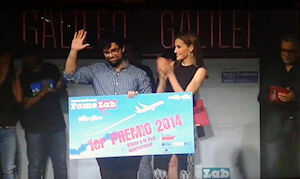 Ricardo Moure , a pre-doc researcher in our lab, has been announced as winner of FameLab Spain in the final which took place on May 14 , in Madrid. FameLab is an international scientific talks competition which started up in 2005 from an original idea at Cheltenham Science Festival, with the main purpose of nurturing the communication of science by identifying, training and introducing new talents - new spokespeople working in science - with an innovative format: short scientific talks. Ricardo Moure made a three-minute monologue about the effects of the fat in our body when we have obesity and how it favors type II diabetes. With this victory, Ricardo has secured participation in the international final of the Cheltenham Festival, to be held from 3rd to 8th of June. Following the publication in Cell Metabolism of a recent paper by F.Celi about shivering, FGF21 and irisin (http://www.cell.com/cell-metabolism/abstract/S1550-4131%2814%2900006-0) and the recent paper from our group in Metabolism on FGF21 expression in human brown fat (http://www.ncbi.nlm.nih.gov/pubmed/24369918), Francesc Villarroya publishes the report “Shivering unlocks new way of fighting fat" in The Conversation, an international on-line journal devoted to public dissemination of scientific findings (https://theconversation.com/shivering-unlocks-new-way-of-fighting-fat-22662). Our research team has been awarded by Fundació Marató TV3 for developing the project “ Lipotoxicity, hepatic steatosis and hepatocarcinoma: function of the mitochondrial protein family armc10/armcx”, in coordination with the Department of Cell Biology of UB and the Institut de Recerca Vall d’Hebron. The project was one of the 42 projects awarded among the 318 projects apllying for support to the 2012 " Fundació Marató de TV3" call for research on cancer. The project will be developed during the following three years, and will explore the role of the mitochondrial proteins armc10/armcx in herpatocarcinoma and the involvment of lipid metabolism alterations. 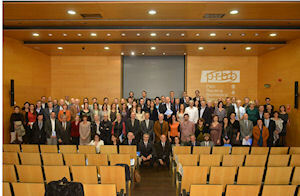 The principal investigators of the projects received the awards at PRBB auditorium , last November 12th. Francesc Villarroya presentation ”Brown adipose tissue, a sink of glucose disposal? Effects of FGF21 on glucose metabolism in brown adipose cells” (address for webcast presentation: http://www.easdvirtualmeeting.org/resources/5945) and the poster communications “Alterations in the levels of endocrine factors FGF21 and FGF19, and in the expression of their receptors, are associated with impaired glucose homeostasis in obese patients” and “Involvement of the endocrine factor FGF21 in the beneficial effects of dietary long-chain n-3 polyunsaturated fatty acids” presented by José Miguel Gallego-Escuredo and Joan Villarroya, respectively, showed recent data from our lab to this major international scientific event concerning diabetes research and treatment. 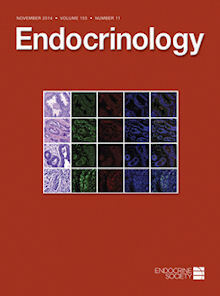 The publication “White, brown, beige/brite: different adipose cells for different functions?” selected as “Editor’s choice” in the September 2013 issue of Endocrinology. 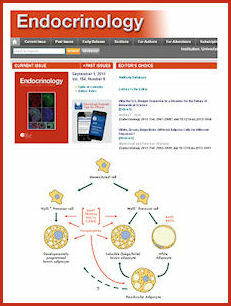 The paper “White, brown, beige/brite: different adipose cells for different functions?” (http://www.ncbi.nlm.nih.gov/pubmed/23782940) by Marta Giralt and Francesc Villarroya has been selected as “Editor’s choice” in the September 2013 issue of Endocrinology, a leading journal of the USA Endocrine Society. Our publication “An endocrine role for brown adipose tissue?”, “Featured Article” in the journal American Journal of Physiology-Endocrinology and Metabolism. 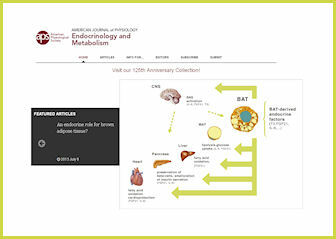 Our paper “An endocrine role for brown adipose tissue?”, (http://www.ncbi.nlm.nih.gov/pubmed/23839524) published in July 2013 in the “Perspectives” series of the American Journal of Physiology-Endocrinology and Metabolism, has been chosen as “Featured Article”. This paper discusses the current evidence that brown adipose tissue, in addition with its known role in energy expenditure, could also behave as an endocrine organ and release regulatory factors, the so-called “batokines”. The American Journal of Physiology is the leading journal of the 125th-year-old American Physiological Society. Our research team is the only Spanish lab that will receive funds from the programme fostered by the European Foundation for the Study of Diabetes (EFSD) and the pharmaceutical firm Nova Nordisk in 2013. Funds will be employed in a research project for the Identification of novel endocrine factors secreted by brown fat (batokines) with anti-diabetic action. 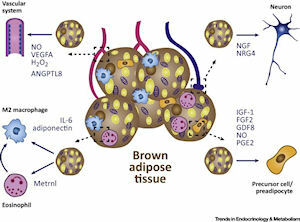 Within the project, which will be carried out between 2013 and 2015, our group will use some experimental protocols for laboratory animals to study the role of brown fat —primary organ responsible for generating heat— in endocrine functions; in other words, the study of how brown fat secretes a series of factors involved in signalling pathways of lipid metabolism and glucose homeostasis. The objective of the project is to study and identify the role of batokines —factors secreted by brown fat — in lipid metabolism, blood glucose control and the processes related to molecular inflammatory mechanisms. In the future, the research might contribute to provide new treatments for diseases such as obesity and diabetes, two major threats to global public health that are rapidly getting worse in most developed countries. The review "Beyond the sympathetic tone: the new brown fat activators" by F.Villarroya and A.Vidal-Puig, published in the May issue of the journal Cell Metabolism. “La Caixa” and Associació Catalana d’Universitats Públiques (ACUP) are the promoters of Programa RecerCaixa. The call for ReserCaixa grants awards every year the best research projects from Catalan research teams. In 2012, 369 projects applied, among which 25 were finally awarded. Our research project on FGF21 and development got one of the awards providing funding for a two-year research period in this area. 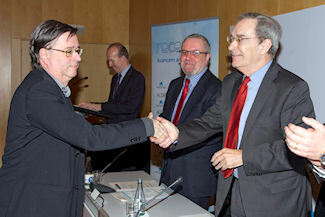 In the picture, the director of Recercaixa and Dr Villarroya in the act of awards in CosmoCaixa in February 2013. 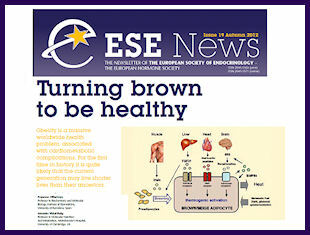 ESE News, the newsletter journal of the European Society of Endocrinologist features the article "Turning brown to be healthy" by Francesc Villarroya, in co-authorship with Antonio Vidal-Puig. The autumn 2012 issue of the jorunal includes the article summarizing the emerging concepts on the role of brown adipose tissue in energy expenditure and the recently discovered molecules (FGF21, Bmp8b, irisin,...) controlling its activity. Our research group participates in the discovery of a new mechanism of regulation of brown adipose tissue, as published in the May issue of Cell. The Bone morphogenetic protein B (BMP8B) plays a key role in the regulation of thermogenesis in brown adipose tissue, according to the conclusions, acting at both central and peripheral level. The finding was the result of investigations conducted by the research group of Antonio Vidal-Puig, University of Cambridge, UK, with the participation of laboratories from Iowa (USA), Stockholm (Sweden) and Santiago de Compostela. In this collaborative research, our group provided, among other contributions, key information on the role of PPARalfa in the control of the Bmp8b gene. Biochemical Journal comments our recent paper “Pref-1 in brown adipose tissue; specific involvement of in brown adipocyte differentiation and regulatory role of C/EBPdelta” by Jordi Armengol and collaborators. Under the title “Pref-1 preferentially inhibits heat production in brown adipose tissue”, Eric Kalkhoven and collaborators from the University Medical Centre Utrecht comment our recent publication in Biochemical Journal (Armengol J et al. Biochem J. 2012 May 1; 443(3):799-810), our findings indicating a repressive role of Pref-1 in brown fat thermogenesis and the evidence that specific manipulation of brown adipose tissue may open up new therapeutic ways to combat obesity-associated health problems. Our publication "Peroxisome Proliferator-activated Receptor-gamma Coactivator-alpha Controls Transcription of the Sirt3 Gene, an Essential Component of the Thermogenic Brown Adipocyte Phenotype” in the Journal of Biological Chemistry has been designated as one of the best papers published by the journal in 2011. The journal selected only 20 papers – out of the more than 4,000 that were published last year – to receive this special designation. They chose one paper for each of the jounral’s affinity groups, and the study by Giralt and collaborators represents the best in the Bioenergetics affinity group. 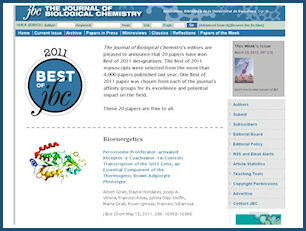 Journal of Biological Chemistry will make a public announcement soon, and have made all of the Best of 2011 papers freely accessible at http://www.jbc.org/site/bestoftheyear. The Journal of Biological Chemistry is the official journal of the American Society for Biochemistry and Molecular Biology (ASBBM), established in 1905, it is among the international journals on Biochemistry with the highest international reputation. A preview on the role of irisin in white-to-brown adipose transformation in the March 7th issue of Cell Metabolism. Francesc Villarroya reviews and discusses the recent identification of irisin, a novel myokine, on the "browning" of white fat, the process by which brown adipocytes develop inside white adipose tissue depots. Francesc Villarroya contributes to the dissemination of recent research on the control of brown adipose tissue activity and its relevance in obesity. 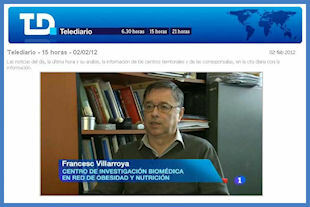 On February 2nd, 2012, Francesc Villarroya has been interviewed in Telediario, the major news program in Spanish TV, to explain the significance of recent findings on the control of brown fat activity and novel agents stimulating brown fat thermogenesis in relation to energy balance and obesity. "A report and interview with Francesc Villarroya in the Newsletter of CIBERobn"
A report in the newspaper "El País" summarizes the current advancements in brown adipose tissue research in relation to obesity and quote the opinions of F Villarroya among other experts. 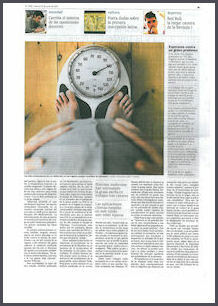 Our research group is contributing to scientific spreading: “Brown fat and Obesity” in the April issue of “Investigación y Ciencia”, the Spanish version of Scientific American. In the section “`Panorama”, Francesc Villarroya, Roser Iglesias and Marta Giralt summarize the recent evidence of the importance of brown fat in adult humans and its role in energy expenditure and the control of obesity. We report that brown adipose tissue is not only a target but also a source of the hormonal factor FGF21 after activation of thermogenesis. This discovery may be the tip of the iceberg of the recognition of a novel endocrine role of brown fat as source of regulatory molecules with impact in overall metabolism. The Figure at the end of the study summarizes the major findings. The December 2010 issue of the journal Current Pharmaceutical Design, with the title "Targets of Metabolic Toxicity of HIV Antiretroviral Drugs: The Multiple Roads to Lipodystrophy and Metabolic Syndrome", has been edited by our research team in collaboration with P. Domingo. The December issue of Current Pharmaceutical Design has been devoted to "Targets of Metabolic Toxicity of HIV Antiretroviral Drugs: The Multiple Roads to Lipodystrophy and Metabolic Syndrome". 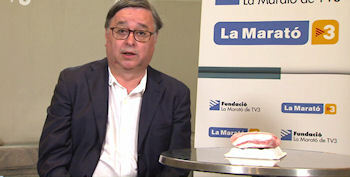 Francesc Villarroya, in collaboration with Pere Domingo, acted as executive guest editor of this issue. The issue includes several review articles on the distinct aspects of the ethiopathogenesis of lipodystrophy syndrome and the metabolic alterations appearing in HIV-1-infected patients under antiretroviral treatment. Adipose cell alterations, inflammation, lipotoxicity and pharmacogenomics of the syndrome are among the subjects covered. The most recognized international experts in the field have participated in the issue. The cover of the journal depicts the lipotoxic events associated with these metabolic alterations in HIV-1 patients. The XI International Congress on Obesity, held in Stockholm, has distinguished the communication “ FGF21, a novel actor in the control of brown adipose tissue activation Thermogenics” presented by our team as one of the top five communications. This communication was selected among 1,250 worldwide research projects. Specifically, it has been considered the best communication in the field of Experimental Medicine and Physiology (one of the five areas of research in the Congress). An article on the discovery of a new pathway of thermogenesis hormonal control, carried out by our research team, on “Cell Metabolism” cover. The publication, edited on “ Cell Metabolism” March issue, identifies the hormonal factor FGF21 as a new activator of brown adipose tissue and its metabolic consumption activity. FGF21 is produced by the liver that releases it into the circulation in response to the stimulation of fatty acids. The study, based on the use of neonatal mice as an experimental model which are exposed to milk fat for the first time in their development, identifies a new pathway of controlling the energy expenditure with potential therapeutic application in obesity and type II diabetes.